Many people are uncomfortable talking about their finances or estate planning with others, especially members of their own family. 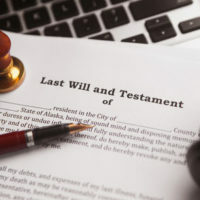 Indeed, one question we often get is, “If I make a will, does everyone else have to know about it?” Or put another way, is your will a matter of public record? As long as you are still alive, your will is a purely private matter. You can lock it away in a drawer somewhere and never tell anyone about it. And even though Florida law requires you to sign the will in the presence of at least two witnesses, those witnesses do not need to know the contents of the document, only the fact the document you are signing is your will. But once you pass away, that changes. By law, the person who has physical custody of your will must “deposit” or file the will with the clerk of your local court within 10 days of your death. Once the will is filed, it generally becomes a matter of public record. Now, “public” does not mean your will is broadcast for the whole world to see right away. Florida courts do not make wills or other probate records directly available via the Internet. But anyone who shows up at the clerk’s office and asks to see the will–or even make a copy–is free to do so. And if a third party obtains a copy of your will legally and decides to post it in a public forum, there is no law that prohibits such actions. If even this level of potential public disclosure concerns you, it might be in your interest to establish a trust. Like a will, a trust allows you to distribute your property to your chosen beneficiaries after your death. But trusts are normally not a matter of public record. With a trust, you transfer property to a trustee (which can be you) during your lifetime. After your death, a successor trustee takes over and carries out your instructions. But since the trustee, not you individually, owns the property, it does not pass under probate–i.e., the property is not subject to the terms of your will. So by having a trust, you can maintain a certain level of privacy. A person cannot simply show up at the clerk’s office and demand a copy of your trust, as the trustee is not required to file the trust instrument after your death. Of course, if there is litigation involving your trust, that may cause parts of the document to become public. And by law, the trustee must allow the beneficiaries of the trust to see the document. Privacy is just one potential benefit to making a trust. An experienced Fort Myers estate planning lawyer can go over some of the other benefits and drawbacks with you. Contact the Kuhn Law Firm, P.A., at 239-333-4529 today to schedule a free consultation with a Fort Myers wills attorney today.